Named after the Latin for eye due to the detail in the back upholstery. “The Oculas Chair” was designed by Hans J. Wegner in 1960. It was was re-introduced by Carl Hansen and Son as CH468 in 2010 based on Hans J. Wegner’s original full scale working drawings. 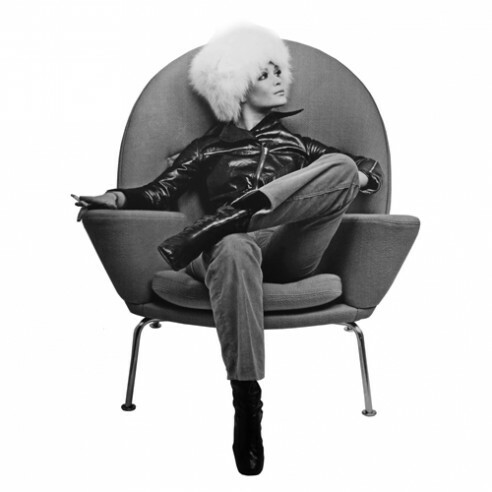 Like the “Wing Chair” (CH445) which the Company had successfully re-launched four years earlier Oculas shares the internal construction of another famous Wegner creation and the designer’s personal favourite from this period, the “Ox Chair” (EJ100). This is unsurprising as all three designs were drawn by Wegner within the space of a few months during 1960 for A.P. Stolen, the then manufacture of his large easy chairs. The construction of all three chairs consists of the seat, armrests and back in laminated ply supported on a frame of solid beech overlaid with moulded foam providing the shape and form of the upholstery. Oculas, Wegner also drew clear references from another chair he had also designed for A. P. Stolen seven years earlier in 1953 – “The Upholstered Peacock” (PP521). This previous design was constructed using traditional upholstery materials that required great craft skill in the shaping of its complex curves. By 1960, moulded foam was more readily available and Wegner choose this simpler much more economic industrial material in the construction of these large comfortable arm chairs. Like the Ox and Wing Chairs, Oculus sits on a light almost transparent frame of tubular steel and all three are perfect examples of Wegner’s cabinet making craftsmanship combined with his sense of the sculptural form. The latter being an interest Wegner had began cultivating as a boy in Tønder, when he loved woodcarving making a number of statuettes out of scrap wood from construction sites, the former albeit in this instance is hidden beneath sumptuous upholstery. As an easy chair, CH468 takes up a lot of room while its deep curves and enveloping arms rests allow one to sit in a variety of positions. The CH446 footrest is a perfect compliment to the Oculs Chair.